Bishop Cynthia Fierro Harvey and a small contingent from the Louisiana Annual Conference strengthened relationships with the Lydia Patterson Institute in El Paso, Tex. during a trip to the school last week. In mid-February, Dr. Socorro Brito de Anda, president of the Lydia Patterson Institute in El Paso, visited United Methodist churches in all six Districts of the Louisiana Conference. The Lydia Patterson Institute is a United Methodist nonprofit institution of learning dedicated to providing quality bilingual cross-cultural academic education. 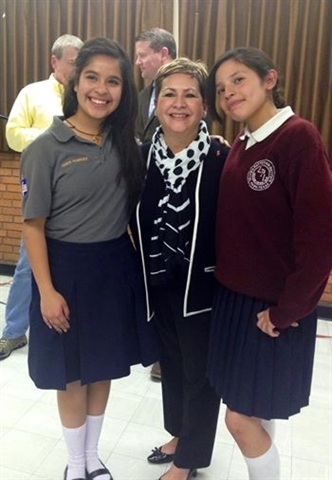 During the Louisiana group’s visit to the school, Bishop Cynthia Fierro Harvey is shown sharing an evening of fun with students at the Lydia Patterson Institute.